Our Expert Team made for your loyal clients a tailored Death Valley package. We propose to your corporate clients from Las Vegas, this Death Valley experience. They will spend 2 days and 1 night in this oasis. The Ranch portion of the property is a mile down Route 190 from the Inn. Evolving from its initial 1950s footprint as a simple motor lodge with rooms and accompanying patios overlooking a grassy courtyard shaded by century old willow trees to the back, everything at The Ranch is being redesigned and redeveloped. 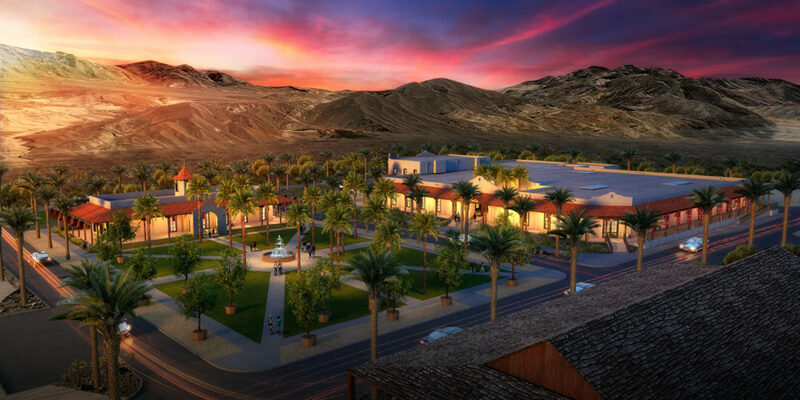 What was once a barren parking out in front with many disparate components like a Post office, Borax Museum, and riding stables will be tied together with a mission-style town square where resort guests and Death Valley visitors alike can gather and trade stories. Death Valley tours from Las Vegas stops at Dante’s View, Zabriski Point, Artist’s Pallet, Badwater Basin, Furnace Creek and Devil’s Golf Course. This journey takes you right to the heart of Death Valley. Breath taking photos opportunities at Dante’s View and Zabriskie point. A stunning scenic drive through the Artist’s Pallet and of course a stop at Bad Water Basin-at 280 feet below sea level this is the lowest point in the Western Hemisphere! Take a walk out on the most protected salt flats on earth. Stop at Furnace Creek visitor center, the Devil’s Golf Course and browse the Death Valley gift shop heading back through the Mojave Desert with your convertible car!